The approach for deploying a containerised application typically involves building a Docker container image from a Dockerfile once and deploying that same image across several deployment environments (development, staging, testing, production). If following security best practices, each deployment environment will require a different configuration (data storage authentication credentials, external API URLs) and the configuration is injected into the application inside the container through environment variables or configuration files. Our Hamish Hutchings takes a deeper look at 12-factor app in this blog post. Also, the possible configuration profiles might not be predetermined, if for example, the web application should be ready to be deployed both on public or private cloud (client premises), as it is also common for several configuration profiles to be added to source code and the required profile to be loaded at build time. The structure of a web application project typically contains a ‘src’ directory with source code and executing npm run-script build triggers the Webpack asset build pipeline. Final asset bundles (HTML, JS, CSS, graphics, and fonts) are written to a dist directory and contents are either uploaded to a CDN or served with a web server (NGINX, Apache, Caddy, etc). For context in this article, let’s assume the web application is a single-page frontend application which connects to a backend REST API to fetch data, for which the API endpoint will change across deployment environments. The backend API endpoint should, therefore, be fully configurable and configuration approach should support both server deployment and local development and assets are served by NGINX. There is one OS process which is relevant to configuration in which reading values from environment values is useful, which is the asset build Node JS process and this is helpful for configuring the app for local development with local development auto reload. Adds to deployment time. Depending on deployment rate and size of the project, the deployment time overhead might be considerable. Is prone to build failures at end of deployment pipeline even if the image build has been tested before. Build phase can fail for example due to network conditions although this can probably be minimised by building on top of a docker image that already has all the dependencies installed. Similar solutions (and downsides) of solution #1 except that it adds clutter to the docker registry/daemon. Scripts that rewrite configuration inside the container can be prone to failure too but they are testable. I believe solution #1 is viable and, in some cases, simpler and probably required if the root path where the web application is hosted needs to change dynamically, ex. : from ‘/’ to ‘/app’, as build pipelines can hardcode the base path of fonts and other graphics in CSS files with the root path, which is a lot harder to change post build. Solution #3 is the approach I have been implementing for the projects where I have been responsible for containerising web applications (both at my current and previous roles), which is the solution also implemented by my friend Israel and for which he helped me out implementing the first time around and the approach that will be described in this article. For code samples, I will utilise my fork of Adam Sandor micro-service Doom web client, which I have been refactoring to follow this technique, which is a Vue.js application. The web client communicates with two micro-services through HTTP APIs, the state and the engine, endpoints which I would like to be configurable without rebuilding the assets. Single Page Applications (SPA) have a single “index.html” as a entry point to the app and during deployment. meta tags with optional configuration defaults are added to the markup from which application can read configuration values. script tags would also work but I found meta tags simple enough for key value pairs. This module will read configuration “keys” by looking them up in the available environment variables (“process.env”) first, so that configuration can be overridden with environment variables when developing locally (webpack dev server) and then the current document meta tags. * Rewrite meta tag config values in "index.html". The script utilises CheerioJS to read the “index.html” into memory, replaces values of meta tags according to environment variables and overwrites “index.html”. Although “sed” would have been sufficient for search & replace, I chose CherioJS as a more reliable solution that also allows expanding into more complex solutions like script injections. The final piece of our puzzle is the local Docker Compose development environment. I’ve included several services that allow both developing the web application with the development server and testing the application when serving production static assets through NGINX. It is perfectly possible to separate these services into several YAML files (“docker-compose.yaml”, “docker-compose.dev.yaml” and “docker-compose.prod.yaml”) and do some composition but I’ve added a single file for the sake of simplicity. Apart from the “doom-state” and “doom-engine” services which are our backend APIs, the “ui” service starts the webpack development server with “npm run dev” and the “ui-deployment” service, which runs a container based on the same Dockerfile, runs the configuration deployment script. The “nginx” service serves static assets from a persistent volume (“www-data”) which is also mounted on the “ui-deployment” script. Since the webpack dev server is a long running process which also hot-reloads the app on source code changes, the Node.js config module will yield configuration from environment variables, based on the precedence I created. Also, although source code changes can trigger client-side updates without restarts (hot reload), it will not update the production build, which has to be manual but straightforward with a $ docker-compose build && docker-compose up. Summarizing, although there are a few improvements points, including on the source code I wrote for this implementation, this setup has been working pretty well for the last few projects and is flexible enough to also support deployments to CDNs, which is as simple as adding a step for pushing assets to the cloud instead of a shared volume with NGINX. If you have any comments feel free to get in touch on Twitter or comment under the article. 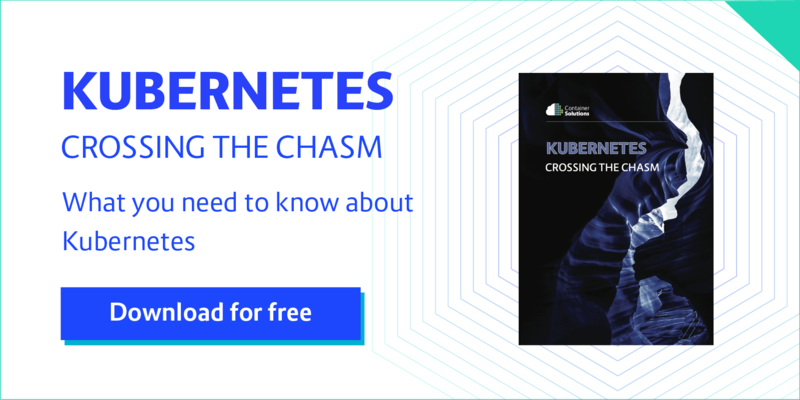 Download our free whitepaper, Kubernetes: Crossing the Chasm below. thank you for sharing this approach. 1. you can also use Docker’s ENTRYPOINT instead of Kubernetes’ initContainers feature. A custom bash script can be used as an entry point in order to rewrite the index.html when the container starts. The advantage is that this is easier to test locally. The disadvantage is that bash kung-fu can feel a bit cryptic and unreadable. 2. if you’re using some framework such as Angular with server-side rendering, then there are techniques you can use that make it easy to transfer the environment variables from the server side to the client side in a clean way.